It’s a funny feeling to realize you’re being watched. It’s even weirder to realize that your own dog is staring at you while you brush your teeth, eat your breakfast, or spend time reading in bed. While being stared at by a dog might be less disconcerting than being stared at by a person, it’s still odd! There are a lot of reasons why your dog stares at you, and we broke them down so you'll know what's up with your pup the next time you lock eyes across the room. Most of the time that you catch your dog staring into your soul, it’s because you’ve got something she wants. That could be a toy, a tasty morsel, or a hand that should be petting her. Staring at you can also be a sign that your dog wants to be let outside. Dogs quickly learn that staring at us is an okay way to ask for something. In fact, you probably have a hand in teaching your dog this behavior because you gave your dog something when she stared. You might have fed dinner (causing begging), absentmindedly reached out to pet, or taken her for a walk. In essence, you trained your dog to stare by rewarding her for staring! As annoying as the staring can be, you’ll probably agree that staring is a better way to ask for something than barking, digging, or biting! Dogs that stare during training, especially with that cute tilted head, are probably a bit confused. Your dog is trying to figure out what you want—much like you’re trying to figure out what she wants! It would be so much easier if we all spoke the same language. If you catch your dog staring at you when you ask her to do something, it’s time to backtrack your training a bit and find a way to communicate more clearly. So if you ask your dog to sit and she just stares at you, go back to the drawing board and re-train the behavior. Your dog isn’t being willfully disobedient. She’s just confused! There’s an entirely different sort of dog stare out there. Right before many dog bites, the dog gives a “hard stare.” This stink-eye look can last just a split second or go on for minutes. It’s one of many warnings of a dog bite. Confusingly, many dogs will also avert their gaze before they bite. If you’re petting a dog or approaching a dog’s toy, food, cage, or bed when she turns and stares right at you, back off. 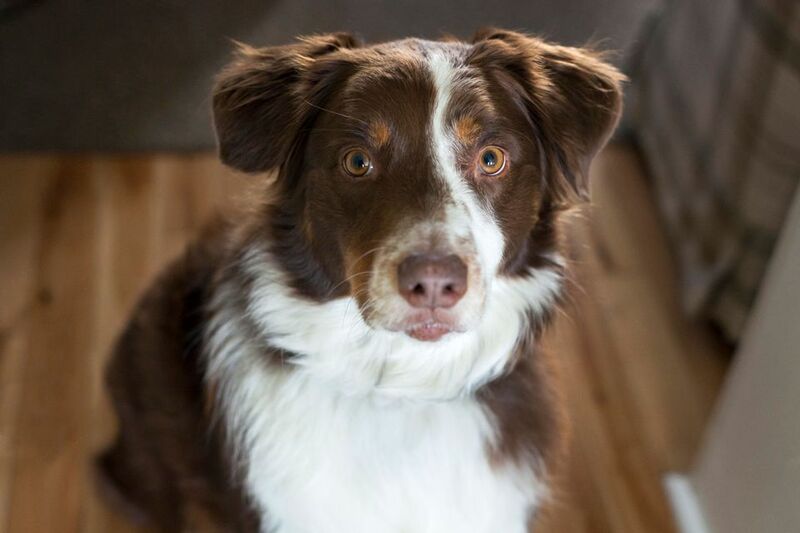 It can take some serious practice to tell the difference between what animal behaviorists call a “hard stare” and just a longing look for liver treats. Give your dog space if her stare is accompanied with a stiff tail (wagging or not), still body, closed mouth, dilated pupils (wide pupils), a lowered head, ears pinned forward or backward, and a strong body shift forward or backward. You might not see all of these signs at once, but look out for any combinations. Dealing with canine aggression isn’t easy, but the least you can do at this point is to back off. Confronting a dog isn’t worth it! On the exact opposite end of the spectrum, your dog might be looking into your eyes because she loves you. An article in Science from 2015 found that dogs and humans both release oxytocin when they look into each other’s eyes. This soft gaze can easily be mistaken for a hard stare for new owners, so context is important. This sign that your dog loves you will probably be accompanied with a soft or sweeping tail wag, a light pant, relaxed ears, and normal-sized pupils. Many dogs are more prone to loving gazes early in the morning, when serotonin levels are highest. Your dog is unlikely to look lovingly into your eyes when she’s playing, eating, or training—so assume that she’s got a different motivation if that’s what’s going on. Herding dogs are also prone to staring, as a way to control sheep, goats, cows, toys, and people. The famous “eye” of a Border Collie comes out as the dog stalks a flock of stock, a toy, or a playmate. Hunting dogs also often stare when they’re on the prowl. This behavior can be playful or serious, but comes out often when you’re in the middle of a game or the forest. If you notice your dog suddenly slow down, lower her head, and stare into the distance (or at a moving object), she’s probably in hunting or herding mode!